"ANYWAY....here is one of my favorite Phaser rifles. I bought it from Next Gen's Property Master on one of my set visits. It was the day they filmed inside the Borg "hall" for the 6th season's cliffhangar "Decent part 1". 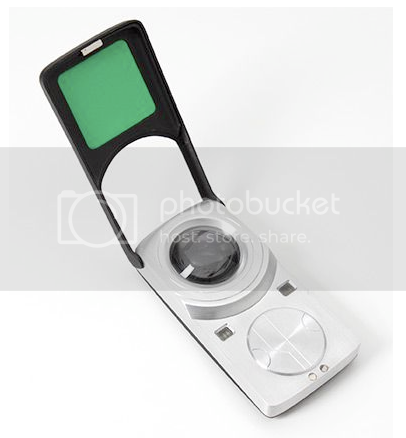 I saw this being used right in front of me, and when I went to lunch with the P.M. we worked out the deal and when I left that day, I left with the prop." Comes with an LOA (Letter of Authenticity) detailing the history of the prop (it was also used on DS9), and is guaranteed to be authentic. 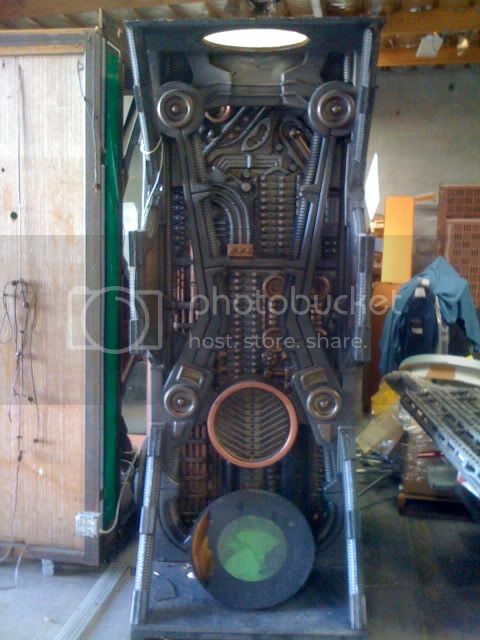 OK, so the seller didn't get it from the Prop Master, the guy he bought it from CLAIMS he did. 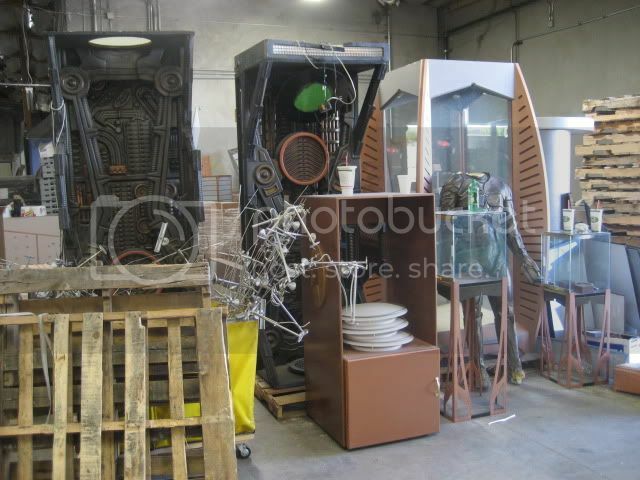 I don't know about you, but I don't know many prop master's who sell props on the studio lot. 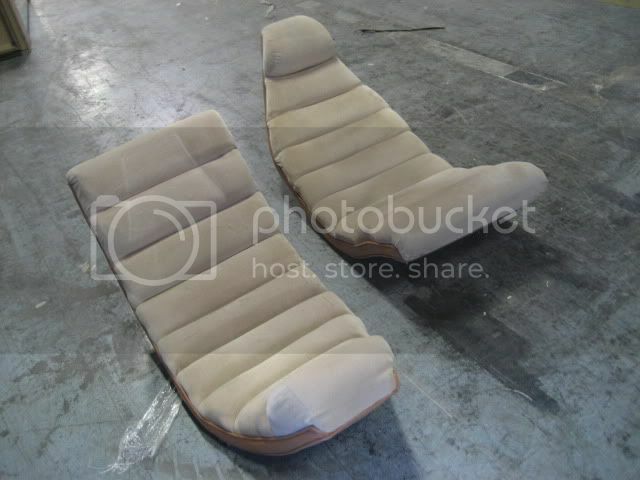 Now, to be fair, no one makes replicas in rubber. So that works in its favor. Still, shaky provenance and way overpriced. 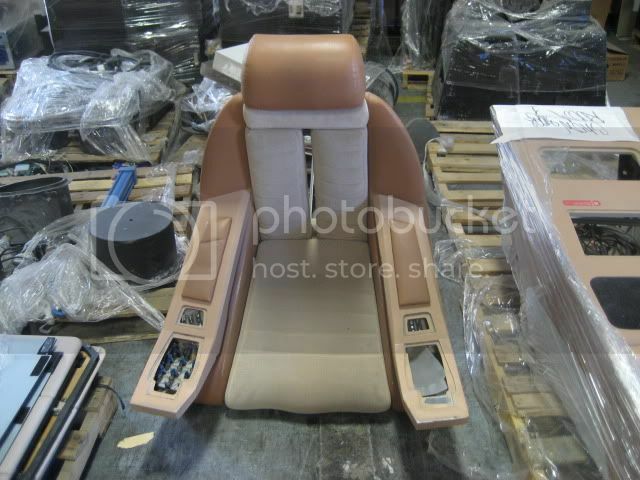 Julien's Auctions has added a Star Trek items to their Summer Auction on June 27th. What was originally just props & costumes from the new movie has morphed into a broader Star Trek sale with the addition of items from Eugene Roddenberry and William Shatner. 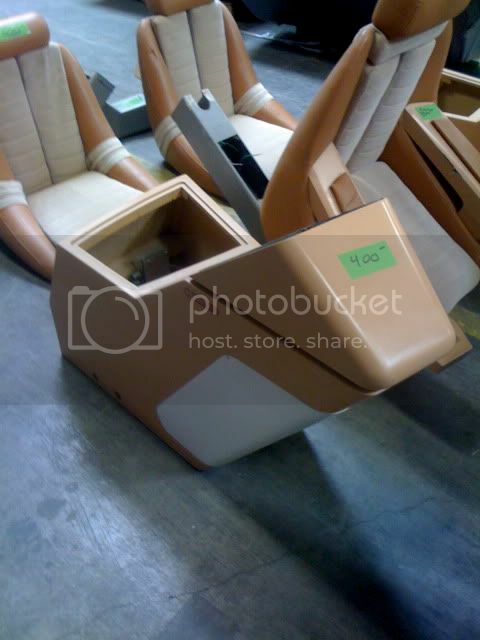 This will be a big summer for Star Trek prop & costume collectors as June will also see the Profiles in History sale, which will have a couple hundred props in their sale, and the Propworx official Star Trek auction (licensed by CBS and including assets from the Star Trek Experience). The items from the JJ movie are all top notch and will draw good bids. But besides a few Majel Roddenberry costumes from her estate, the Roddenberry and Shatner items are not of interest to most collectors. Highlights from Roddenberry's Bel Air home include: a Gene Roddenberry hand annotated script from Star Trek: The Next Generation (Est. 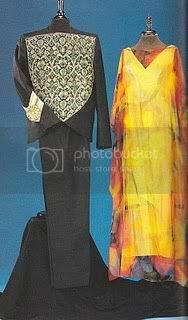 $2,000/$3,000), costumes worn by Majel Barrett Roddenberry as she portrayed Lwaxana Troi in both Star Trek The Next Generation and Deep Space Nine (Est. $800/$1,200), a copy of “I Sing The Body Electric” inscribed to Gene Roddenberry by Ray Bradbury (Est. $1,000/$1,500), a Peabody award for Star Trek The Next Generation episode “The Big Good-bye” (Est. 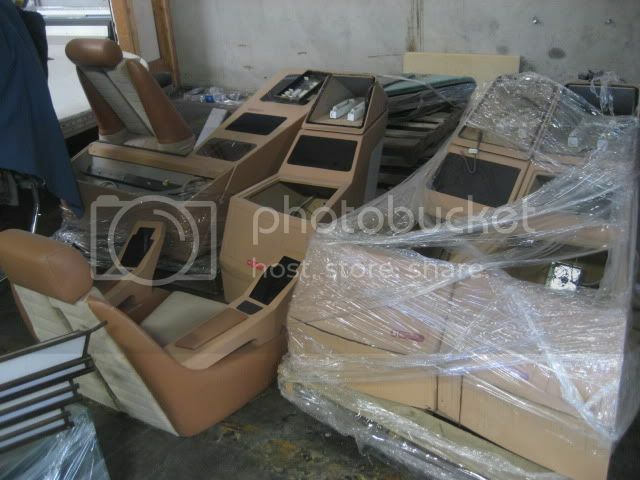 $400/$600), the remaining archive of Lincoln Enterprises Star Trek film clip collection (Est. $2,000/$3,000), cast bronze sculpture after Frederic Remington (Est. $2,000/$3,000), cast bronze figure after Auguste Moreau (Est. 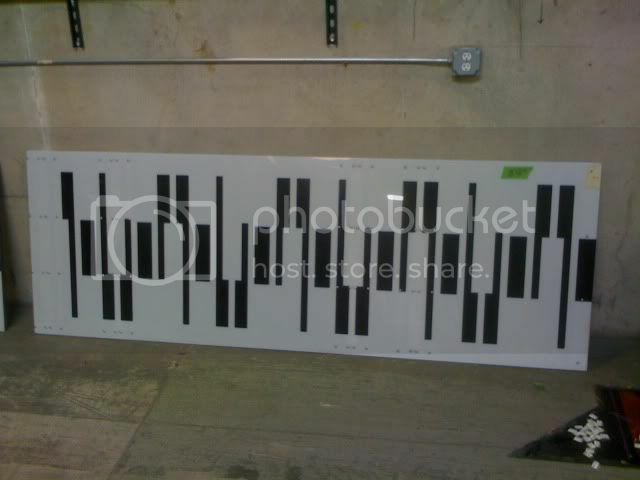 $600/$800), Steinway and sons baby grand piano ($8,000/$10,000) and other fine & decorative art pieces. Leading the collection of William Shatner is his 2005 FXDC Dyna Super Glide Custom Harley Davidson (Est. $12,000/$14,000).Boldly go where no man has gone before… riding William Shatner's motorcycle; the first FX Super Glide was produced by Harley Davidson in 1971. Also included are his Golden Globe nomination certificates for Boston Legal (Est. 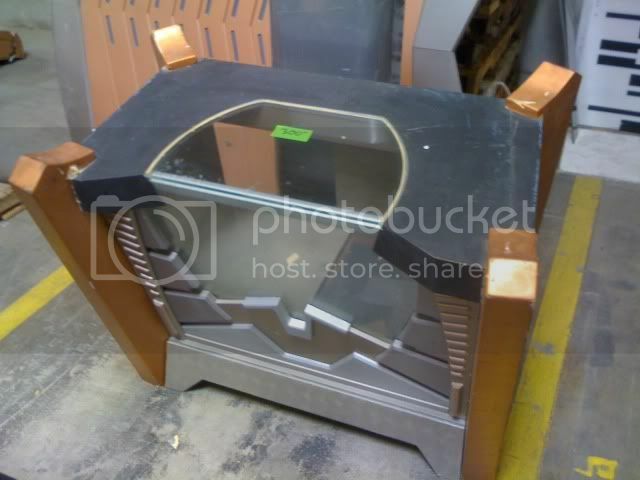 $300/$500), “Rescue 911” pinball machine (Est. $1,000/$1,500), William Shatner original “Walk of Fame” plaque when he received his star on the Hollywood Walk of Fame in May 1983 (Est. 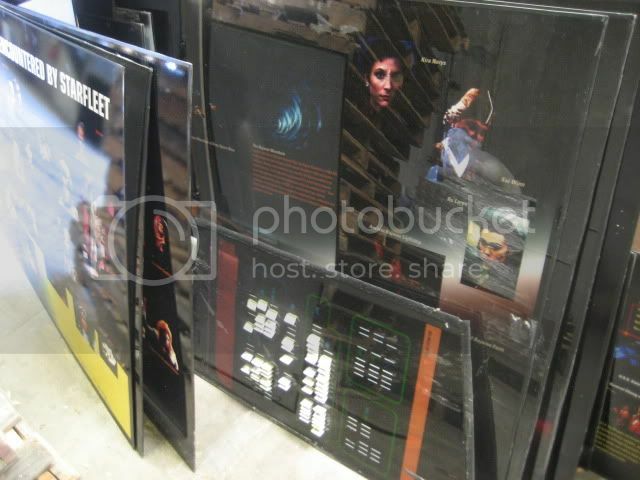 $150/$300) and various ephemera from his personal collection relating to Star Trek and other productions from his career. Now, for any prop & costume collector, the above are pretty boring. The focus for collectors will remain the 25 items from the 2009 movie which are all pretty good. William Ware Theiss or Bill Theiss was the costume designer on the original Star Trek and for the first years of Star Trek: The Next Generation. He was responsible for the iconic Starfleet uniform designs that are so often copied these days. Theiss was a three-time Oscar nominee and an Emmy winner for his work on TNG "The Big Goodbye." Theiss was famous for being able to make something from nothing. He had minuscule budgets to work with on TOS and was still able to create compelling and unforgettable designs that fans will never forget. 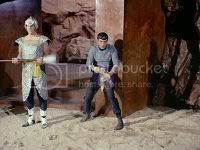 Theiss' contribution to Vulcan design began with the TOS episode "Amok Time" which is probably the best-remembered Vulcan-centric episode of the entire franchise. His costume designs for the Vulcan guards at Spock's koon-ut-kal-if-fee ceremony are simple, yet striking. 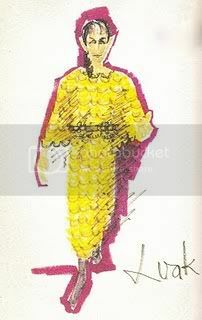 Here is a sketch which became the basis for these costumes. With very few lines, Theiss was able to lay out an indelible design for the guards which was also the basis for Stonn (Lawrence Montaigne)'s costume. 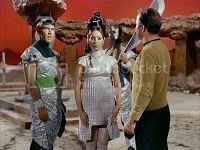 Also in "Amok Time," Theiss created two beautiful costumes for the Vulcan women T'Pring (Arlene Martel) and T'Pau (Celia Lovsky). 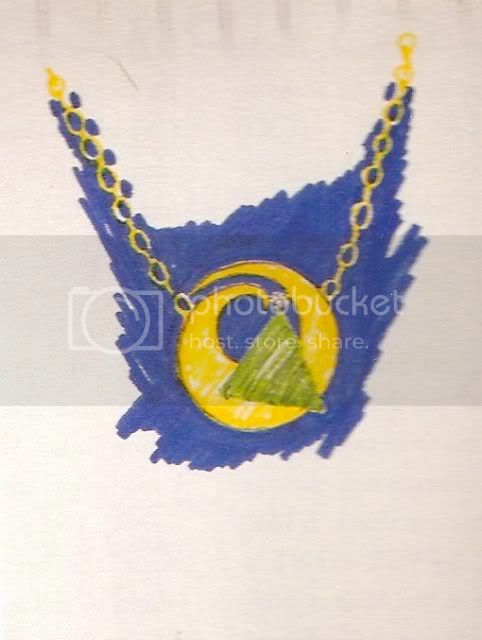 The T'Pau costume began a long tradition of including elaborate jewelry for Vulcan Masters. 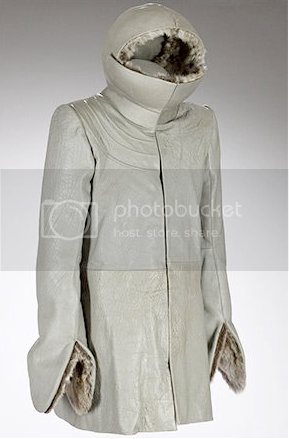 It is such an incredible piece that it sold for $45000.00 at the Christie's 40 Years of Star Trek auction! 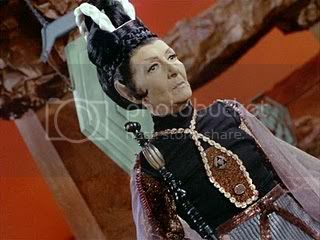 Theiss' Vulcan designs also extended to Spock's parents: Amanda Grayson (Jane Wyatt) and Sarek (Mark Lenard). The ambassadorial couple visited the USS Enterprise in "Journey to Babel." Theiss crafted two militaristic jackets for Sarek and two beautifully flowing gowns for Amanda. 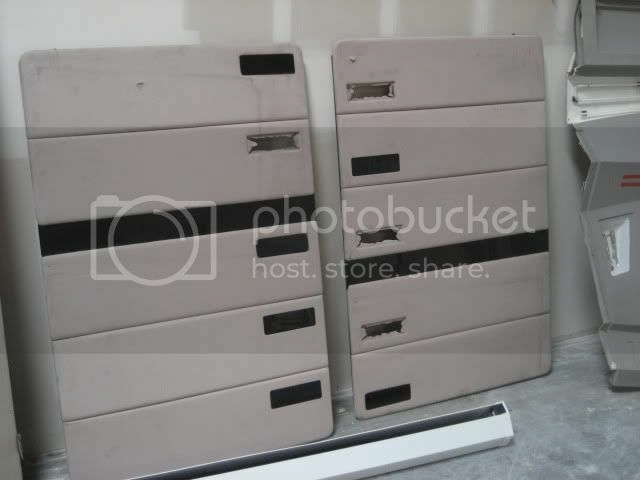 The ones pictured below sold in a Profiles in History auction for $25000.00! What's most impressive about these pieces is that they look like clothes and not costumes. Often, science fiction designers will focus on finding new and interesting "looks" but in the process, forget to create something that feels like a functional item of clothing. Also, established here, is the tradition of dressing Vulcans in warm, earthy colours and metallics. 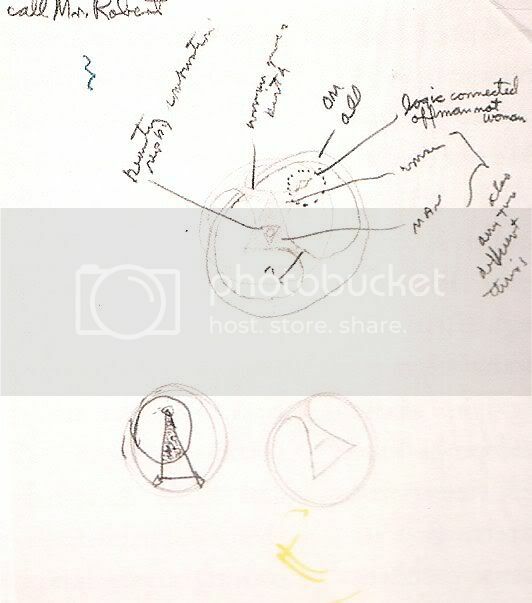 This theory of design will hold (more or less entirely) throughout the next forty-plus years of Star Trek. 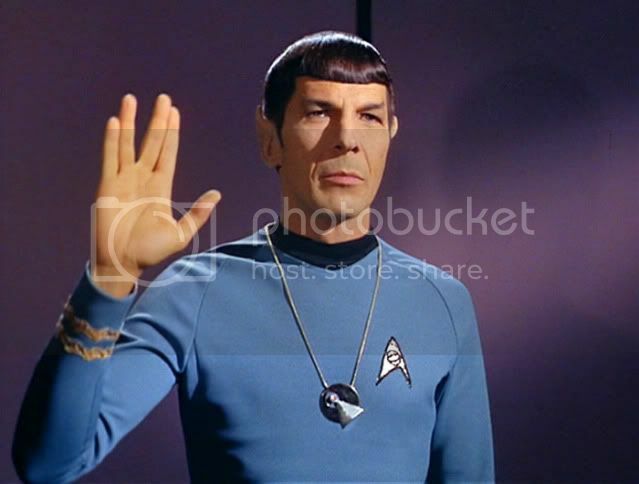 becoming the ultimate symbol to represent the Vulcan species. 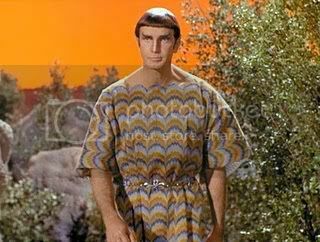 Finally, Theiss created a very memorable costume for the "Father of Vulcan Logic," Surak (Barry Atwater). 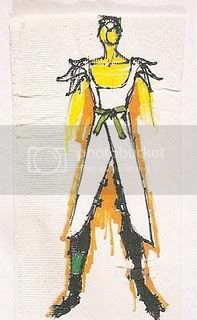 Below is a design sketch for Surak's appearance in the third season episode "The Savage Curtain." All of Theiss' Vulcan costumes manage to create a sense of otherworldly-ness while at the same time, being familiar enough to identify with. They are the clothes that one would expect a race of philosophers and logicians to wear. 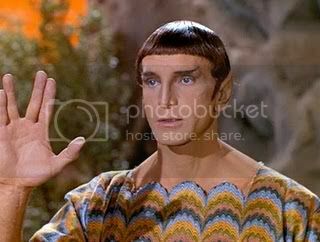 They evoke a sense of mystery, tradition and mysticism that pervades Vulcan culture. William Ware Theiss passed away at the age of 61 in December 1992 but he lives on in his remarkable creations. This hobby has needed a decent, relevant prop blog that focuses on the hobby as a whole and now we have it! 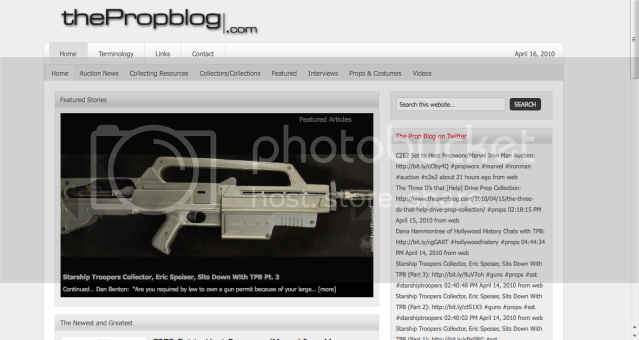 ThePropBlog.com has launched and is written by a friend of mine, Dan Benton. Dan is a professional journalist who owns Giants101, which is the # 1 website for the NY Giants. Dan is a pro and we are lucky to have him in our hobby. He worked for me at my last company as Director of Content and was awesome, so I am glad to have him helping grow the hobby. So check out his blog and don't be surprised if he contacts you for an interview! The sale was a huge success and we had a blast. It was great to see old friends like Francis (who got a bridge chair and nav console) and even my former nemesis Gerald Gurian, who we all had a great time chatting with. Gerald walked away with the Enterprise D Nacelles! Well, he didn't really "walk away" with them, but he bought them and got a great deal! And Daryl was there as always to help out. We also got to have Adam Savage from Mythbusters stop by! And here is a great video you MUST watch! STTE Warehouse Sale Phone ordering update. PLEASE read the rules in my previous blog post. DO not email before 3:00pm. Photos and prices are below. Please note Costumes will be available for sale at a later date. We have a good number of them and I don't want to deal with sizes and such today. They will be taken back to Santa Ana and sorted and sized, for sale at a later date. 49" x 34" x 43"
Missing wheels, scuffed and chipped paint in places, tape marks on counter top. 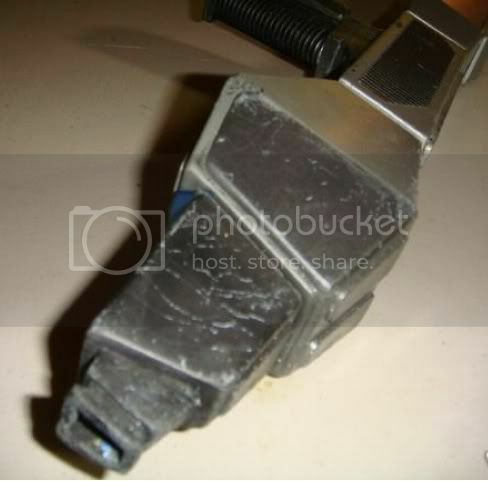 Trim is damaged and needs replacing. 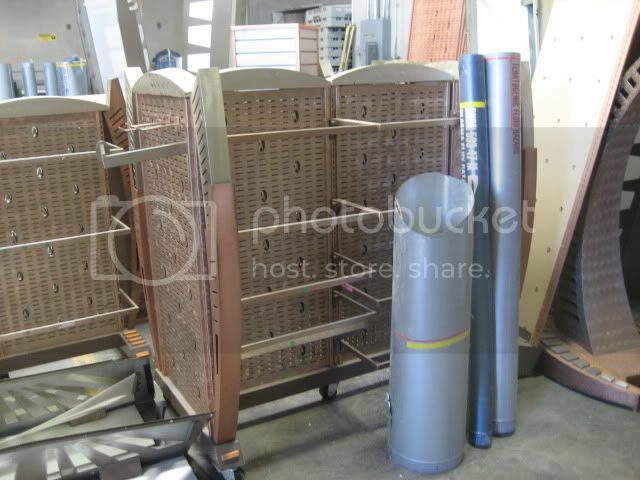 57" x 48" x 31.5"
96" x 36" x 51"
For anyone who wants to order something from the Star Trek Experience Warehouse Sale. Please note first that tonight we will have a ton of photos of the final set-up with everything for sale as well as a video. Please refer to that. We will be accepting emails starting at 3:00pm PST on Saturday and if we have anything left that you want, we will try and make arrangements to get it to you. 1) Look at the photos on our sites tonight. The photos up tonight will show everything for sale. 3) Do NOT leave a voice mail as I have no time to either listen to or answer it this weekend. We are buried! 4) Be BRIEF. I will be getting a ton of emails. 5) If we are sold out, I will respond by email. If not, I will CALL YOU. So include your phone #. 6) I can tell you the price and then you can make a decision. 7) If I tell you I have set aside an item for you, then IMMEDIATELY go to PayPal and pay for it. You will be given an order #. Send your money to startrek@propworx.com and Curtis will record it. Make sure you list in your PayPal payment what it is for and your order #. 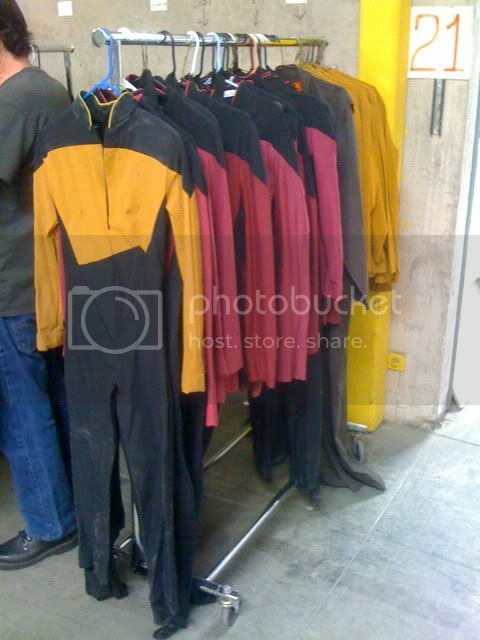 Preparing for the big Star Trek Experience Warehouse Sale! Well, it is 11:00 and we just got back from a 13 hour day preparing for the big Star Trek: The Experience Warehouse Sale this Saturday. It was a VERY long day, but many ex-Experience employees and members of the USS Las Vegas (the biggest Star Trek fan club in Las Vegas) helped us a ton and we are way ahead of schedule getting ready for Saturday. 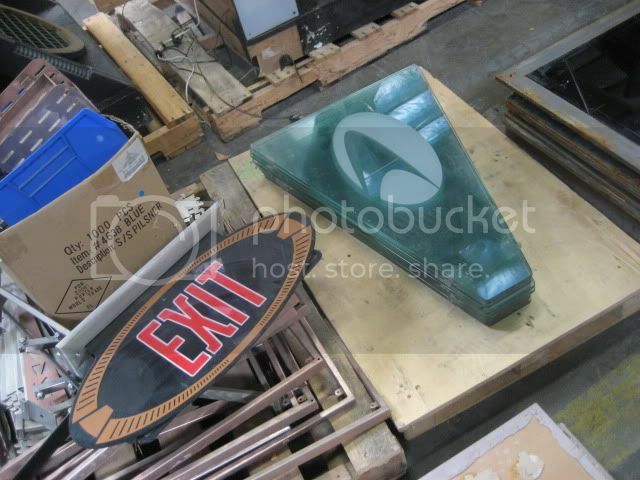 There are a ton of photos of what we have for sale (and some of what we are taking for the August auction) HERE. So if you can't make it and really want something, please call me at 404-918-1701. I can tell you we have two complete TNG bridge sets, one of which we are keeping for the August auction, another that we are selling Saturday. We also have a TON of translights, of every size. We are only taking a few for the auction. 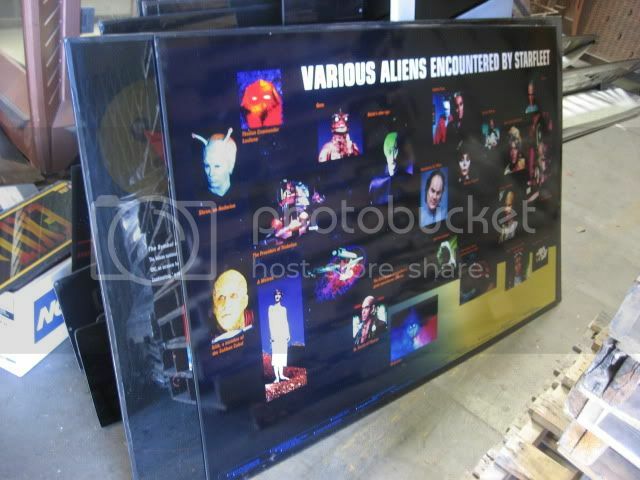 Also, we are selling the "History of the Future" translights that many of you saw when you first enter the Experience. They are all for sale this Saturday. 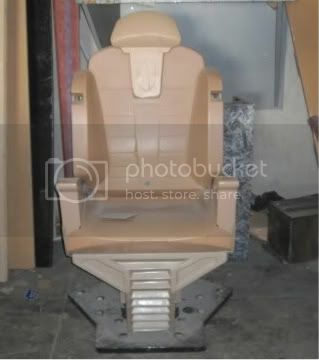 This is the ONLY chair from the Klingon Attack ride that was ever created by itself (All the rest were attached in rows) and this is for sale Saturday! And then we have all 3 ships available for sale! 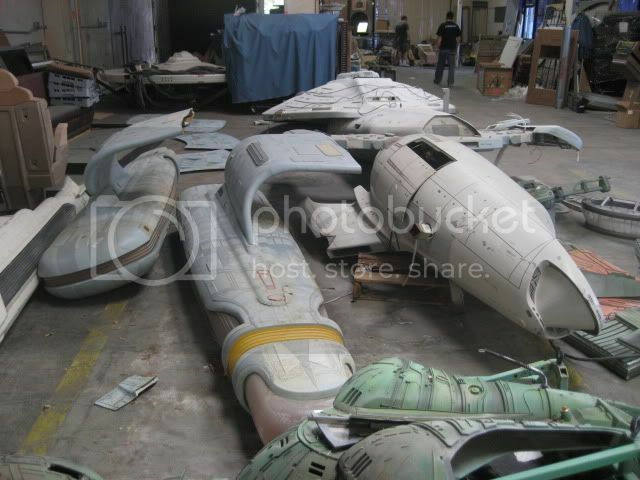 The Enterprise A, Voyager and the Klingon Bird of Prey (but all need some tender loving care and restoration). 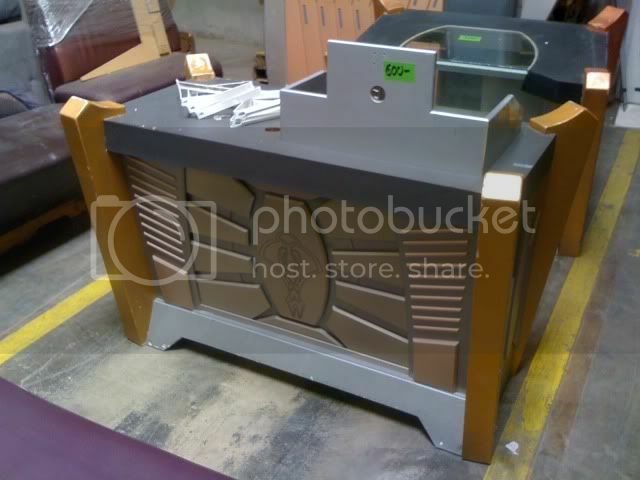 Star Trek:The Experience Warehouse Sale this Saturday in Vegas! Well, we finally are heading to Las Vegas to pick up the assets of Star Trek: The Experience from the warehouse. 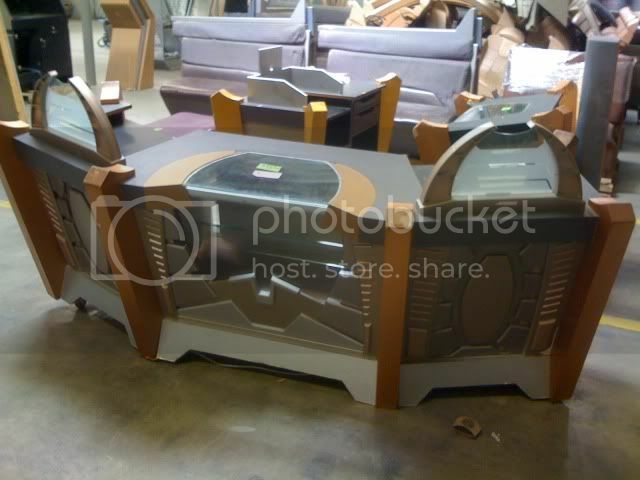 The items we ship back to the Propworx warehouse will be pretty cool and I think everyone will be pleasantly surprised by some of the great items we bring back (think Quark's Bar sign, very cool Captain's chairs, portable Quark's bar sections, bridge items, etc.). 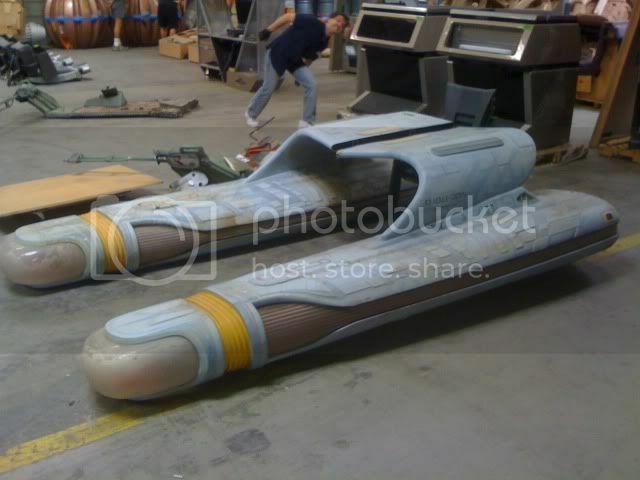 But there is a lot that will not be in the Propworx Star Trek auction. 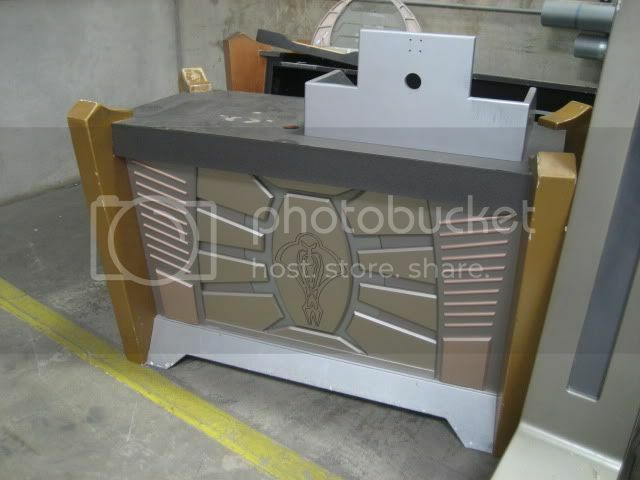 And those items will be sold this weekend at the Star Trek: The Experience warehouse at 66 Spectrum Blvd in Las Vegas. Doors open at 10:00 and close at 3:00 and it is all cash and carry (OK, we will take a check if you twist our arm, but no credit cards). 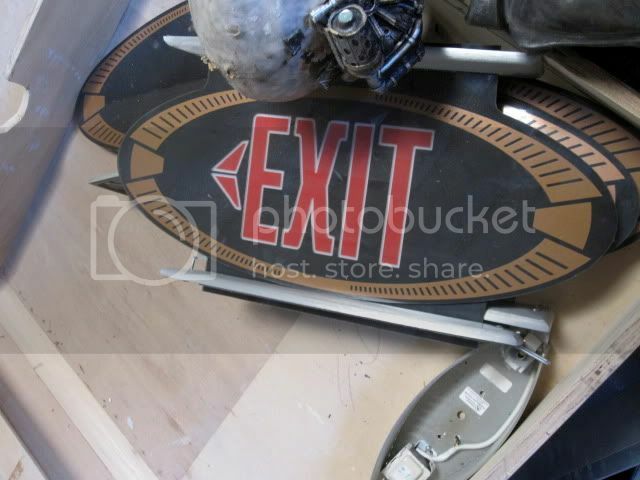 A DS9 Cardassian-style Exit sign! 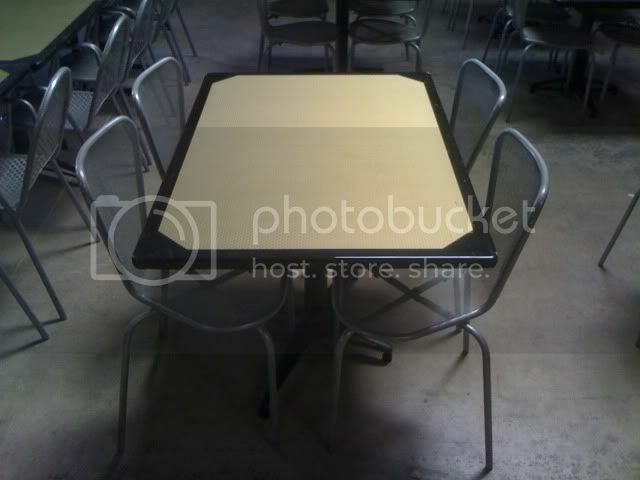 The feature item is a table and 4 chairs from Quark's bar for only $ 195! We have a number of sets of these, so come and get 'em. 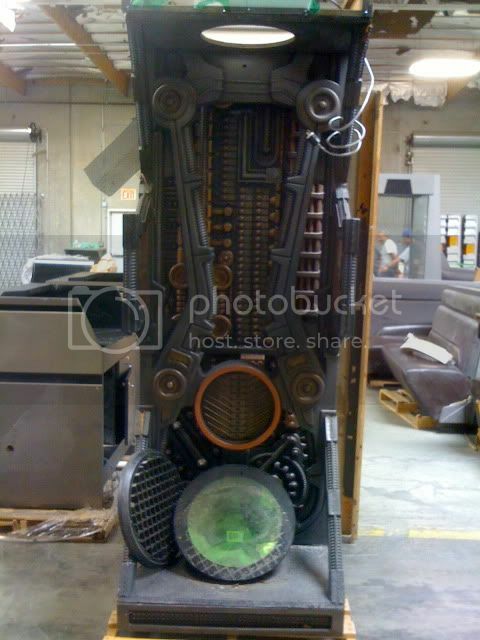 We also have Borg Alcoves, which are very cool, but need a little cleaning and minor repair. (Yes, the one in the photo below is upside down!). 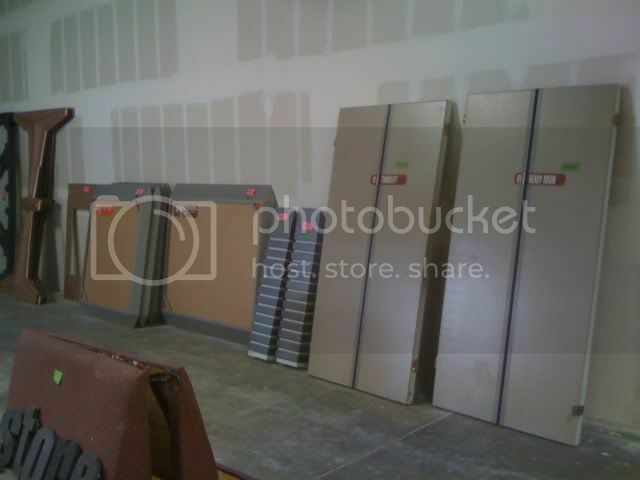 There are also wall panels, bar stools, and plenty of costumes! Both TNG and DS9 style of Starfleet costume are readily available, and we should even have your size (assuming you are not of retired Klingon proportions!). If you have questions, feel free to email me, but we don't have a lot of info as we will be sifting through everything Thursday and Friday, so I will post more info then.